A MUST READ FOR A HEALTHIER LIFE! I found this book enabled me to recognize some of the main reasons which caused me to fail on previous diets. I am on day 19 of “100 days of Weight Loss” and look forward to each new day’s lesson. Each day touches on important emotional struggles with any weightloss program. Love this book! I am on Day 10 and I really find it helpful. It offers good sound advice and a chance to reflect of your own personal weight issues. I thought this was a very good book, with quick, easy, practical lessons. I found it motivating and insightful. Changed my attitude towards food and my eating habits. We all know the details about losing weight. If our intelligence had anything to do with it….we would be thin. A coach to help you through. 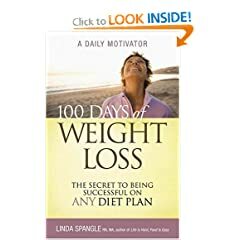 This book is like a coach who will help you through your chosen diet and exercise plan, with its daily readings to get you through the hard moments that come with any diet.